KARACHI: Many local and foreign media outlets have been reporting Pakistan’s placement on Financial Action Task Force’s (FATF) global-terror financing watch-list for the past few days but the statement by the watchdog issued after the conclusion of the 23rd February meeting had no mention of Pakistan. Now, it is not difficult to understand why Pakistan didn’t appear in the grey-list of the global terror-financing watchdog. 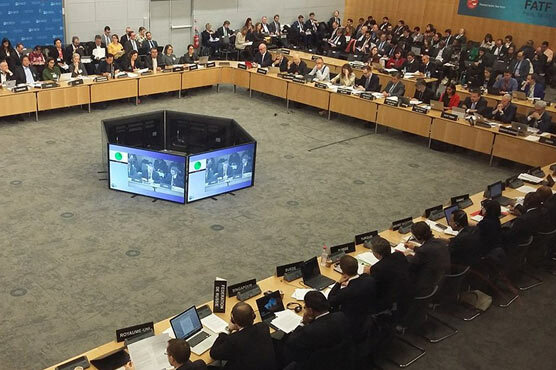 In simple words, Pakistan had failed to come up with a workable action plan to curb the terror financing and the FATF didn’t find the steps taken by Pakistan convincing. Pakistan is on the grey-list and a formal announcement is expected in June this year. Will the FATF place Pakistan on its black-list if authorities fail to devise a plan with the help of the watchdog’s team and implement it? Khurram Hussain, a senior journalist and finance analyst, says ‘Yes’. State Minister for Finance Rana Afzal said they will start meetings to devise a strategy on the issue of FATF after March 1. Adviser to Prime Minister on Finance Miftah Ismail told Reuters in an interview that country’s placement on FATF watch-list would not see any impact from the FATF move. “I would rather not be in the list, but I don’t think it will hurt” economic growth, Ismail said. Amir Rana, a security analyst and the Director of Pakistan Institute of Peace Studies, said an assessment team of FATF will visit Pakistan and along with the Pakistani officials devise an action plan to address the flaws within country’s Counter Terror-Financing policy. According to Amir Rana, the recent crackdown against Jama’at-ud-Dawah and the last year house arrest of Hafiz Saeed was one of the steps taken by Pakistan to escape the FATF grey-list. In an apparent attempt to convince the global community of its efforts to curb terror-financing, Pakistan’s Interior Ministry this month through a notification had ordered to freeze the moveable and immovable assets of Hafiz Saeed’s Jama’at-ud-Dawah and its charity Falah Insaniyat Foundation. Hafiz Saeed was put on the list of designated terrorists by the United Nations Security Council (UNSC) in December 2008 for his alleged role in the Mumbai 2008 attacks. Talking to a news channel, Adviser to PM on Finance Miftah Ismail termed the US motion to place Pakistan on FATF watchlist as ‘inspired by India’. National Action Plan (NAP), a 20-point plan, devised to combat the rising extremism and militancy in Pakistan after a deadly Taliban attack on the Army Public School in 2014 also included freezing of funding sources of militant organization. Tariq Khosa, a former Inspector General of Police and one of the authors of NAP, told this reporter that a task force led by former Finance Minister Ishaq Dar was constituted under the NAP to deal with terror financing. Mr. Khosa said that the task force ‘achieved nothing substantial, unfortunately’.